In the conclusion, it is argued that the institutional history of general relativity and the final structure of the International Society on General Relativity and Gravitation were somewhat peculiar, if not unique, with respect to the various institutionalization processes of international scientific cooperation in the post-World War II period. After reviewing the various cultural, social, political, and epistemic tensions characterizing the development of the international community and its institutional representation, possible explanations of why the field of general relativity was conducive to the establishment of this quite original institutional structure are addressed. 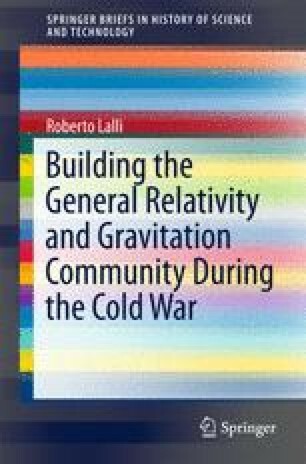 It is argued that this question cannot be separated from questions concerning the effective relevance of the community-building activities for the process of the renaissance of general relativity. These activities shaped the return of general relativity to the mainstream of physics during the formative phase of the “General Relativity and Gravitation” community. Other relevant factors were the special character of general relativity—which was perceived to be unrelated to any direct military applications—and the role model Einstein embodied for scientists working on both sides of the Iron Curtain. Finally, a programmatic reflection on the function held by scientists/community builders in the evolution of scientific knowledge is proposed, based on André Mercier’s role in this specific case. Lalli, Roberto. 2015. “The Renaissance of physics”: Karl K. Darrow (1891–1982) and the dissemination of quantum theory at the Bell Telephone Laboratories. In A bridge between conceptual frameworks: Sciences, society and technology studies, ed. Raffaele Pisano, 249–273. Dordrecht: Springer. doi: 10.1007/978-94-017-9645-3_14.